This one is to help you to learn how to earn a profit with mobile apps! See how I made $5000 with a $50 investment. No fluff.. straight to the point, actionable strategy. 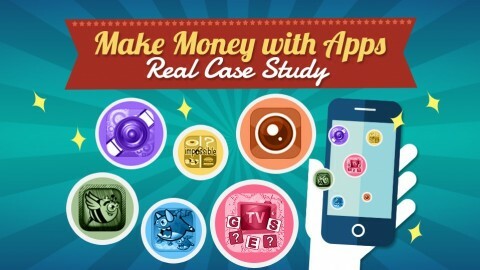 Making money with app. Learn how I made $5000 by uploading 1 app in the App Store that cost me less than $50 to produce. Welcome to the most complete course in Udemy about how to make money with Apps, where you will be able to watch over my shoulder my whole app strategy. I will show you the app that made me the money, the niche, the income, the way it made the money and I even share the source code for you to replicate my success. Yes: You read it right. This course includes the Source Code I used to make $5000 with full instructions for you to start building your apps. You get the full rights to use the source code in your next app. During this course you will learn the art of reskinning for fast money-making in the app stores. BE AWARE: It’s not a get-rich-quick scheme, per se, as it does take some knowledge and strategy, but it’s a foot-in-the-door for newbies to app development or for developers looking for something a little different, and this course explains the smart way to achieve profit in the app store. Previous Post Black Friday Special —> App Marketing Using App Store Optimization (ASO) Next Post Four App Store Optimisation Courses You Need!